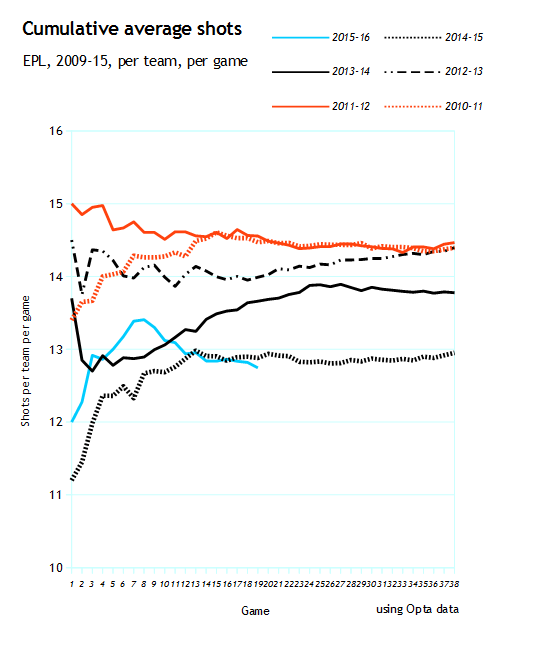 When the Premier League designed it’s schedule, it had little if any thought for half season analysis. With the final 19th game finishing late on a Wednesday evening and the next round of fixtures kicking off the following Saturday, week twenty is upon us and gone before we’ve had time to reflect. But halfway is a good point to take stock: at no other point prior to the end of the season do we find anything resembling its parity in fixtures fulfilled and even if a team has had a tough run of games away from home (say, Liverpool) or the opposite, as Omar Chaudhuri noted during the autumn, perceived imbalance here pretty much evens out. Tough away fixtures mean easier ones at home and vice versa will play out throughout the second half. It is what it is. So as you read this the twentieth round of fixtures are behind us, with a Cup weekend forthcoming prior to a rare midweek set of games. No matter, the points of interest still stand and one game does not wipe out the longer trends seen over the course of five months. In the Enlightened Era (2009-10 onwards) of publicly accessible data, we now have 140 team samples of first 19 games and i’ve looked for a few other trends in more general measures. Part of the reason we are lacking a truly dominant team in terms of results is down to goal scoring. This season is the first since 2006-7 that has found no team in the league scoring two or more goals per game at this point. Both Leicester and Man City have come up one short (37) and nobody else is within five goals. Over the last six years, only one team scoring 1.7 goals per game or more has subsequently failed to qualify for the top four, Man City’s 2010-11 side. This mini-stat is sure to break this year as in addition to Leicester and Man City, Everton, Arsenal and Tottenham are all at or exceeding this mark. Part of the reason for this is that of the strongest shot volume teams: Man City, Liverpool, Tottenham, Arsenal and Southampton, none are converting at over 11.5%. Normally by this point, one of the major contenders is skewing very positively in their conversions yet weirdly only Everton and Leicester are converting at a significantly above average rate (13 and 14% all shots, 39% on target). Everyone else in the league is noticeably behind. Part of Leicester’s success is fuelled by their own positive skew off reasonable numbers, and part of why they are so close to the summit is that other contending teams have not been running hot. They are an interesting case, as Simon Gleave reflected, but nothing about them suggests they will continue to be worth such a lofty position. A plus 14 goal difference is usually enough to give a top four platform, only Southampton 2014-15 have failed since Everton in 2007-08, Tottenham, Man City and Arsenal are all well set here. Five of the last six Champions were top after 19 games, the one team to fail was Arsenal 2013-14, a team that notably exceeded it’s underlying numbers during the first half of that season and duly dropped back. In the same period Arsenal (7th in 2012-13) are the lowest placed team to improve into the Champions League positions. Leeds in 2001-02 were the last team to drop from a position in the top three to outside the top four (a run of 42 consecutive qualifiers), which is a tick in Leicester’s box. Another tick in Leicester’s box is 11 wins, at least the last 18 qualifiers have kept on for top four. Aston Villa’s one win/thirteen defeats combination maps extremely badly. Indeed thirteen defeats is only recently exceeded by Bolton 2011-12; so Sunderland are also historically bad here. We shall see what the departure of Mourinho does to these numbers going forward! Beyond this, there are no pronounced trends in shot conversion, which typically oscillate around a long term mean. It is also amusing to note the predominance of home wins in the week twenty fixtures. At times it can be frustrating when balancing the wider perception of Manchester City against the cold, hard facts of their quality. Simple facts like finishing position show that this is the league’s predominant team of the decade; a 3rd place finish in 2010-11 pre-empting four alternate first and second places. Yet despite a record that is superior to all of their rivals, it seems as if their qualities are undervalued when held against a broad look at modern football. Maybe the lack of recent European success from themselves or their English-based peers has left the casual fan underwhelmed, or a lack of an extensive and successful heritage creates resentment or new found success, or more likely an ingrained distrust of huge foreign investment and the inevitable displacement of more established sides. Possibly the straightforward media and fan view will never be able to see beyond Yaya Toure’s languid style and understand the dominant force he has been. At times even I have become frustrated as once more I cobble together some numbers and find myself looking, yet again, at what looks to be a superior team, which, yet again, is finding a way of hiding itself. At the 12 game point City were putting up extremely strong numbers, so typically they promptly got utterly crushed by the sheer weight of Jurgen Klopp’s charisma. They lightly wobbled through late autumn going 3-1-3 with 11 scored and the same conceded. With a raft of key injuries underpinning this more mortal run of form, the simple narrative turned quickly to skepticism but they have still managed to put up overall solid shot numbers and their run of top two finishes looks highly likely to continue. In our half season sample, they rank 2nd/140 in total shot ratio (66%) and related shot plus/minus (+8.6 per game), 6th in shots on target for (6.5 per game), 9th for shot on target ratio (65%) and first for all shots against (8.8). Yes: this Man City side, shorn of Vincent Kompany for long periods of the season has conceded fewer shots per game over the first 19 games than any other team in the Enlightened Era. All these aspects are good. But what is limiting their progress and contributing to their non-dominant position? City’s shots conceded may be few but those that get through have landed on target at a very high rate, 40% (2nd /140) and opposition shot conversion rate is also high at 12% compared to a league average of around 10%. Over a goal against per game is a poor rate from so few shots. Usually to win a title, you need a combination of excellent shooting numbers and a positive skew from your conversions; City had that in 2011-12 and 2013-14, where they won, they didn’t in 2012-13 and 2014-15, where they finished second and so far they don’t this season either. But in a year in which their viable rivals have changed, they still look extremely strongly placed to battle it out with whoever can best exploit a base of the first 19 games. City are still huge players with only a potential drift in focus caused by Pellegrini’s inevitable departure or a focus on the Champions League looking like challenges the squad needs to overcome. Otherwise they still look to have the most guns and will surely go very close, at least. A huge aspect of Tottenham’s season isn’t just how well they have been playing and how good their numbers look, but how different it looks from the chaos of last season. Throughout last season they were a 52% shots team with a slightly lower on target rate. Par stuff that maintained across each half of the season. Based on any analysis, it looked like major challenges were ahead, but with a mass clear out and what now looks like a well bonded and youthful squad, Tottenham have recorded a huge leap in their underlying numbers with a particular focus on their on target rates. The good part here (volume) lands in the realm of strong sustainable quality but there’s a side order of caution alongside (rates). Let’s take a look. Their overall shot ratio has increased from 52% to 57%, which is impressive in itself but their shot on target ratio has gone from 50% to 66%, a huge increase. Teams posting rates that high, in fact everyone posting 64% and above, have gone on to qualify for a top four slot on 10/10 occasions since 2009-10 and understandably, the components reflect well too. Tottenham’s “For” rate ranks 10th/140 and their “Against” rate 11th/140. There has been some debate around where Tottenham’s true rate lies, and the most likely answer appears to be somewhere in between, but towards which end may well determine whether they are hovering around third or fourth or pushing for more. Where further caution comes in is in the rate in which all their shots are landing on target. Tottenham’s all shot numbers are fine, good but not spectacular, and the divergence between these and those on target is revealing. Over 42% of Tottenham’s shots have landed on target, a full 2% higher than any other team in the sample and the difference in this rate and that of their opposition’s rate (29%, so a full 13 percentage points) is significantly higher than the previous highest: ten percentage points. As such, there is a huge likelihood that Tottenham’s rate will revert as the season wears on, but it is worth noting that often when a metric such as this skews so positively, it’s reversion will likely still maintain it at a high rate. This advantage Tottenham are enjoying may reduce but should not disappear. Indeed it is more likely that any skepticism borne of noting such positive skews is likely only to see effect longer term, and depending on how these metrics tally come season’s end, 2016-17 may well be a more interesting test of the “new” Tottenham’s true ability. Often it takes a long time for these things to shake out. Chelsea 2014-15 are the prime example here. The positive skew they enjoyed prior to Christmas was enough to give them a basis for league victory and the some of the reversion that took place over the second half of the season was predictable, that they cut the cord on the bungee this year was a step well beyond and envisaged by none. Regardless, this is strong team within this league and the foundations have been laid for long term prosperity, something that looked to be a year or more away back in August. The trio of bad from the twelve game review have manfully clung on to their pitiful titles. For Newcastle, Aston Villa and Sunderland, this truly has been the half season of nightmares and that they sit in the bottom three is apt. For Newcastle to have accrued seventeen points from such utterly terrible shooting numbers is quite a generous achievement. Everything shot related reflects on them badly: they have taken the fewest shots of any team in the sample (9.0 per game), have the worst total shot ratio (35%), the second worst plus minus for shots (-7.8) and the sixth worst shot on target ratio (36%). 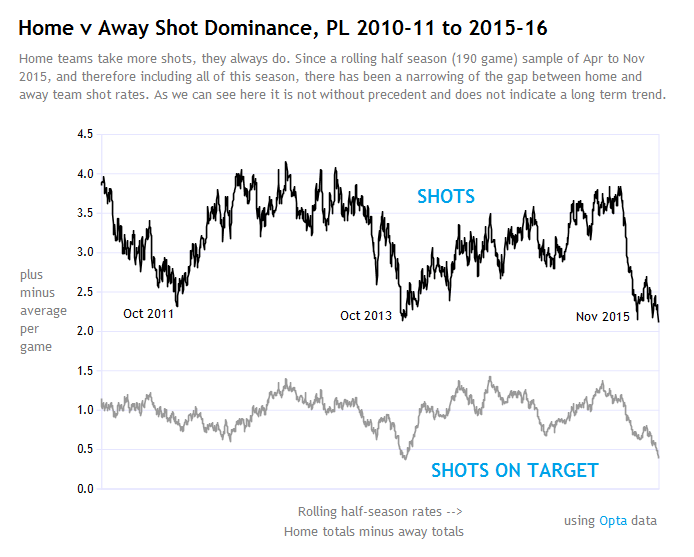 As if to add fuel to the fire, the shots they are conceding are going in at a high rate (13%). A major concern looking forward is how in recent years as a club, they have been reliant on building a mid-table points total by halfway then coasting in. Pardew’s 2013-14 team fell in a huge hole after Christmas and John Carver’s tenure from last season had nothing go right. It’s simply vital that in some way, Steve McClaren averts a similar malaise, which, given that this team is tangibly worse than those that have failed before could well be a tough job. Luckily for them Aston Villa have reserved a relegation spot already and they are close enough to rivals to have some hope. But it does not reflect well on a team that spent good money in the summer to be so distinctly bad. I reflected on Villa recently but mainly their conversions are abysmal, all shots are 7% for and 14% against (5th/140). The rate in which the opposition is troubling Brad Guzan is extremely high (38%, 10th/140) and they are bad at winning games (one, joint 1st/140) and really good at losing games (thirteen, joint 2nd/140). In normal circumstances, all this looks like prime relegation fodder, and quite possibly that will be the case, but in Allardyce, they now, and probably for the first time in years, have a coach that should be able to squeeze the absolute maximum out of not only the squad but also the inadequate numbers they have been and most likely will continue to produce. Plus they are Sunderland and far too many “Sunderland relegation” predictions have miraculously failed over multiple years to make anything like a dispassionate judgement on their survival chances. But: they are bad, that much is true. More is needed. Though not as historically bad *in the numbers* as the three, both Norwich and Bournemouth have vulnerabilities that need to be overcome to prevent getting involved and West Brom are doing it Pulis style off sub-par metrics. When margins are so small a couple of fortunate bounces converted into wins can make the picture look very different. With half a season to go, I would posit that only Villa can be reliably discarded. It is rare we see an entirely new attempted method of deriving results in the league and under Louis van Gaal, we have found Manchester United largely eschewing shot volumes and relying on defence first to drive his consecutive top four bids. The 8.9 shots conceded per game is only beaten in the whole sample by Manchester City’s current similar rate; this team is highly effective at repelling opposition shots. However, the new and different output is based around their attack. Their 11.2 shots per game ranks only 118th/140 and their on target rate (3.6/game) ranks 106th. Top four contenders simply don’t take eleven shots per game. Arsenal 2013-14 qualified for the top four despite starting with a first half 14.0 shots/5.6 on target and van Gaal’s first bid incorporated 12.8/4.7. It’s new and different to have decisively mid-to-lower table attacking numbers glued onto a first class defence. 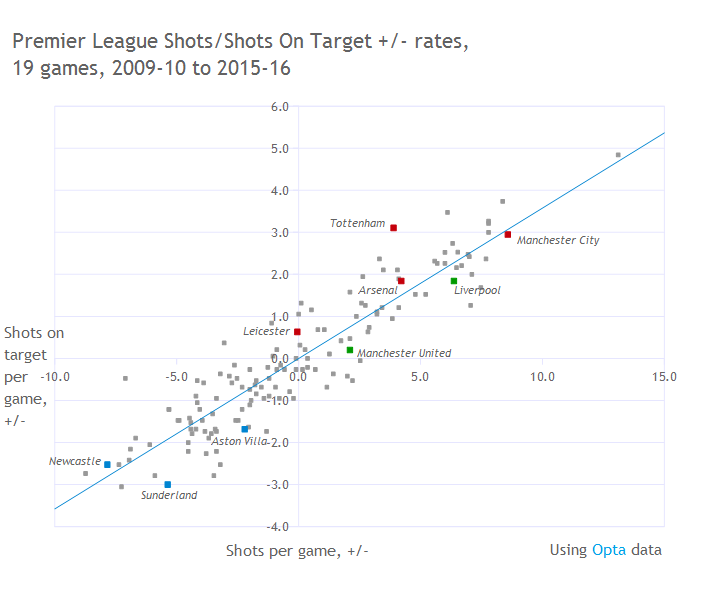 A rate of 3.6 shots on target per game is so low that it has been exceeded by twelve of the last eighteen relegated sides and an average top four qualifier takes over 5.9 per game, so to be anywhere near these positions with such a neutered attack is either an endorsement of van Gaal squeezing as much as he can from a limited squad, or a reflection of his defensive wizardry. It’s counter intuitive from an entrenched perspective of creating attacking dominance as the primary method to win, and it may not work long term, but it is at least an intriguing technical experiment. A glimmer for Manchester United fans, starved of energetic displays can be found in the increase in rates and form that van Gaal oversaw during parts of the second half of last season. They survived a similar late autumn lull in 2014-15 by riding a few of their conversions, fortune that deserted them throughout this December but eventually found some form as winter drew on. Already under external pressure, at least, van Gaal still has over three months to go to exceed the duration of his Bayern Munich tenure. Parallels are easy to draw. Certain teams look more like usual top four contenders than others. Arsenal look like Arsenal usually do: strong top four contending numbers. They have dipped from a strong position at 12 games and their own fitness and the failure of others, or specifically Manchester City, are likely to be the greatest drivers towards a title run. Neither of these are insurmountable, both may be outside their control. Bournemouth’s all shot opposition conversion rate is an astronomical 17% which is a full 3% higher than any other team in the sample. Their save percentage is a little better off though also bad at 55% (3rd worst) and the opposition is finding 38% of it’s shots reaching the goal (11th worst/140). Considering these huge handicaps, their accrual of points is fairly impressive, indeed, general shot numbers are solid for a promoted club. Liverpool are posting reasonable shot numbers but getting turned over by conversions at both ends, their 61% save percentage is 2nd in the league behind Bournemouth’s and they are only finishing 7% of their shots; also bad. We have seen familiar errors at the back and an inability for either coach to get a functional attack working. The only two teams that didn’t register in any category as either notably good or bad, sustainable or not were Watford and Southampton. A clear demarcation between thumbs up and thumbs down here for the two clubs.